Seeking to support a new technical staff training strategy, PayPal turned to Iflexion to develop an internal learning portal. Our Customer is PayPal, the world’s leading online payment system provider operating in 200+ markets and having over 170 million active accounts registered all around the globe. With more than 15,000 full-time employees working on constantly expanding markets, the Customer was highly interested in efficient and consistent personnel training. The company’s particular focus was on high-quality training for newcomers to facilitate their adaptation and let them start their productive work faster. Considering the company’s size and geographical presence, a centralized learning management system with formalized training processes would be the best option. Relying on a long-term expertise in web portal development for enterprises of all sizes and business domains, PayPal turned to Iflexion to implement a corporate training portal integrated into the company’s IT infrastructure. As the sole vendor engaged in the education portal development, Iflexion provided the full stack of software development services, including requirements elaboration, tech consulting, portal design and implementation, as well as QA, followed by the solution’s further enhancement and support. Our team selected the Moodle e-learning platform as the solution’s basis and PHP as the fundamental technology for the portal’s development. An Open Source platform, Moodle is well-known for its scalability; it enables developers to build robust solutions for both online and offline learning. The PHP-based portal developed on top of Moodle handles SCORM (Sharable Content Object Reference Model) compliant online learning objects – quizzes, online courses, tests, assignments, etc. The developed solution offers various features to three major groups of users, including learning instructors, system administrators and newcomers. The solution also provides reporting features, enabling learning managers to obtain comprehensive insights into employees’ progress. Managers can also see courses that trainees’ registered for and control if they opted in or out, attended or missed a particular training session, passed or failed in order to effectively track employees’ results. As soon as Iflexion’s team completed the education portal development, the Customer came up with the request to transfer the project knowledge to the PayPal’s internal team for ongoing system support. The major challenge was to ensure smooth integration of the solution into the Customer’s existing IT infrastructure and establish seamless access of the geographically scattered employees to the project knowledge base. Iflexion organized a series of online video conferences to ensure knowledge transfer without hindering PayPal’s core business processes. In 2 months, the company’s personnel were fully capable of supporting the delivered solution without Iflexion’s assistance. Iflexion’s team developed the solution based on an open-source learning management platform Moodle that is a digital space for storing self-contained ZIP files with educational content. Compliance with the SCORM standard ensures ubiquitous access to learning materials across all offices regardless of employees’ location. The portal is integrated with the PayPal corporate network through a Single Sign-On (SSO): any employee at PayPal can access it by filling in their personal credentials. 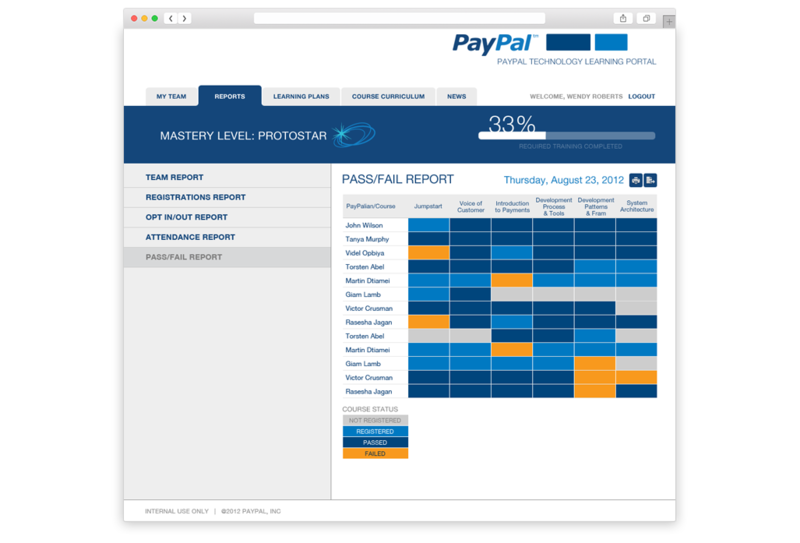 Used by thousands of PayPal’s employees, the developed solution played an important role allowing the company to shape a new advanced vision of corporate training. The new solution enabled PayPal to reduce the internal learning curve, thus minimizing the time that newcomers need to start contributing to the company’s operations actively. Iflexion took up education management system enhancement to enable school principals, their assistants, and government representatives to manage schools and students in a centralized manner. Iflexion sets up a web portal that enables users to participate in communities and subscribe to educational services. Iflexion delivered a powerful training platform for online education of satellite operators, eliminating all expenses and risks related to live satellite manipulation. The solution blends basic and ad-hoc e-learning features to enable seamless training process.